When an enemy rune is destroyed, deal 1 damage to your opponent. 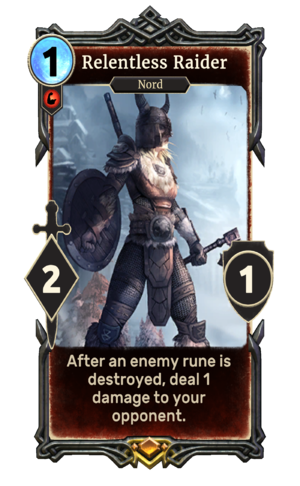 Relentless Raider is a legendary Strength creature card. It is part of the Core Set. "I have no fear of you, cowardly skeever!" "I can take a pit-bait weakling like you!" This page was last modified on 14 February 2019, at 00:23.